She is the NBC News Chief Foreign Affairs Correspondent, and reported on the 2008 Race for the White House for NBC News broadcasts, including NBC Nightly News with Lester Holt, Today, and MSNBC. 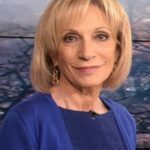 She anchors Andrea Mitchell Reports airing from 12:00 noon to 1:00 p.m. ET weekdays on MSNBC, has appeared on and guest hosted Meet the Press, and is often a guest on Hardball with Chris Matthews and The Rachel Maddow Show. "They put me on the shift where they thought I could do the least harm, midnight to eight in the morning. Although the hours were lousy, they were perfect for an apprentice reporter." "When it came to political power, blacks need not apply. Add to this steaming stew the growing tensions over the Vietnam War and the movement for civil rights, and you had plenty of elements to fire the imagination of a novice journalist."